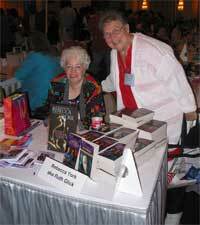 I’m frequently asked for advice on writing for Harlequin Intrigue. Here are some of my thoughts on the subject. I think of an Intrigue as having three basic components: an emotional romance, a strong danger element, and a mystery that the characters and the reader must solve. All these parts must fit together in one seamless whole. meet while they’re both searching the sister’s house for clues; the bad guy ambushes them both, and they barely get out of the house alive. Now they’re trying to solve the murder together–and save their own lives from the killer who has focused on them. This opening brings all the important ingredients into play, and they all must flow together throughout the story. If I have to pull back on any element to give enough play to the other two–it’s the mystery that gets less attention. I try to weave it into the story, but I want to keep my focus on the developing relationship between the h/h heightened by the danger/suspense. I do use the viewpoint of secondary characters in moderation, most often the villain, but I basically tell the story from the point of view of the hero and heroine. I try to keep them on page together as much as possible, and I always have them meet very close to the beginning of the novel. Not because it’s part of a formula, but because the book is short, and the characters are the focus of the story. These people give life to the plot. It’s their emotional reaction to the danger and to each other that pulls the reader in and makes her care. I love writing tough, hard-bitten, wounded heroes redeemed by the love of a good woman. My heroines must also be strong–in order to stand up to these men and also to survive the fearful situations I create for them. My women are as likely to rescue their guys from death as the other way around. For me, the emotional/sexual component is a big part of the story. I want to feel the growing sexual tension between two characters thrown into a pressure cooker of peril. I want them to fall deeply, passionately in love. And I want them to fear that their newfound happiness can be snatched away at any moment by the evil forces bent on their destruction. My stories explore their passion and their desperation through love scenes that focus on the intimacy of their physical relationship. But I’m always mindful that the push-pull of an Intrigue plot can create problems here. To heighten the danger and the tension, the time frame of the story should be short. Yet if the action is compressed, how can these people really have time to fall in love? Often I solve the problem by giving them a shared past. They don’t meet for the first time at her sister’s house. They meet again–and are forced to solve the relationship problems that pulled them apart. I love putting my characters through hell, because I know they have the strength to take what I’m dishing out. And I’m going to reward them in the end with the warm, lasting relationship they’ve always longed for. During the course of the story, it’s all a juggling act. But writing for Intrigue is the perfect venue for the author who wants to try her hand at stirring suspense and danger into her romance.